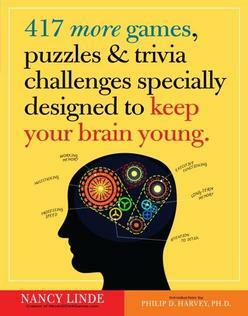 Nancy Linde, Philip D. Harvey, Ph.D.
399 Games, Puzzles & Trivia Challenges Specially Designed to Keep Your Brain Young became a word of mouth sensation and strong impulse seller, with 133,000 copies in print. 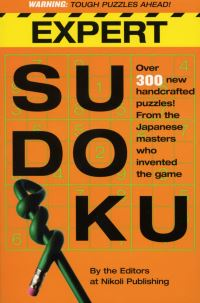 Based on the science that shows that people middle aged or older who solve word games and brainteasers have a significant cognitive advantage over those who do not, 399 Games cross trained the brain while being first and foremost loads of fun. 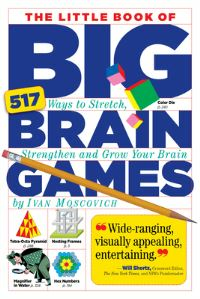 Master game and puzzle maker Nancy now offers 417 more of her delightful brain exercising challenges. 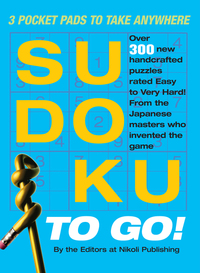 Readers who enjoyed the first book will find new iterations of those games and puzzles, as well as more than a dozen new formats, and many new "one-off games, making this new book feel fresh and familiar at the same time. What the legions of fans of 399 Games, Puzzles & Trivia Challenges Specially Designed to Keep Your Brain Young have been clamoring for; more puzzles and games not just to entertain, but to help adults aged 50 and over improve their main cognitive functions - created by a professional who works with seniors, and vetted by a leading neuroscientist.